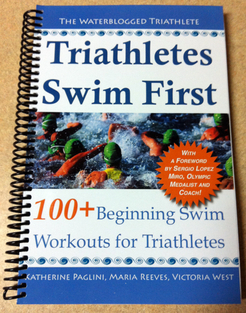 One of our fellow bloggers was able to get us a copy of a video of her swimming. Unfortunately, her shoulder has just started bugging her so she’s going to be focusing on running for the time being. She’s given us permission to use a few screenshots to go along with our comments and drill ideas for her to incorporate when she gets back in the pool. Your recovery above the water is swinging way too far out to the side. It is almost like you’re doing a one armed butterfly recovery instead of a freestyle recovery. I saw on your blog that you suspected dropping your elbow made your shoulder pop but I suspect it might have more to do with your recovery. It’s really important to keep that recovery close to your body and your elbows nice and high. I would recommend doing finger tip drag and the zipper drill, and doing them often to the point where they almost feel like second nature so you won’t have to think about the recovery so much. Three count pause drill is another good one for you to work on. Make sure you exit the water at your hips and keep your hand near your body from the second you exit the water. If you have to, try touching your hand to your hips as you exit the water so it starts close to your body and focus on keeping it nearby. As a result of having a tight recovery, it’s likely your hips will be more in line and they won’t sway out to the side. Your pull under water is too wide, especially on the left arm. Freestyle has evolved away from it’s original “S” pull. Instead, trace a line directly under your shoulder from the moment your hand enters until you push past your hips. Your elbows should be above the level of your hand when you’re pulling. Some coaches tell their swimmers to imagine that they are “scooping a barrel” to keep that elbow high. Swimming with fists is a very good way to get the feel of the water on your forearms in that beginning part of your pull. When you do this, remember to keep the elbows up and think of tracing that line under your body. You should also practice sculling to help you feel the water better. As for your comment via e-mail that you don’t feel much in your lats, make sure you finish your stroke fully and exit at your hips. You want to swim longer than you are. We thank you for sending us your footage and are here to help when you get back in the pool. We are all hoping you have a full and speedy recovery!!! For everyone else – have you ever had your stroke analyzed? Wow, thank you SO much for taking a look at the videos! #1 – with the zipper drill, do you “zip” up the side until you hit the armpit then continue on with your stroke? The tight recovery concept is very difficult for me; I’ve always considered myself somewhat flexible, but for some reason my arms don’t want to move up and in on this. #2 & 3 – I definitely will try these; I’ve had difficultly performing the “line under the body” plus the “barrel” so hopefully the fist drill will help. PS – if you want to include a screenshot from the videos to explain the wide recovery, etc, it’s no problem. Wish you were here….lol….I’d love to have my stroke analyzed. I used to be criticized for not pulling the “S” so I was glad to see it had fallen by the wayside in the ensuing 25 years. I was just ahead of my time! That would be awesome but I can help you from here too. If you’re able to get footage to me, I’ll take a look at it if you like. PS – way to be ahead of the curve on your underwater work! I have never had my stroke analyzed — I think I should!! It is so helpful to see what you look like in the water from time to time. If you get me some footage I can look at it if you want. Brittany, I’m so glad we were helpful! Your stroke is good for the most part, but there’s always room to improve. For anyone else out there looking to improve technique, it’s always a good idea to have someone take a video of you swimming. Even if it’s just a friend who records you with the camera on their phone. You can watch it back later on your computer! If you’ve never seen yourself swimming before, it’s definitely something to check out. We all pretty much know how freestyle should look, so you could even critique yourself! There are plenty of things you could catch yourself doing wrong, and improve them the next time you’re in the pool! I think it is absolutely great that you all are willing to help us “non” swimmers. To get advice on your own style is priceless. Keep up the great contribution and I look forward to doing some video in the very near future. Thanks! It is something I/we really enjoy. Swimming is very important to me and has played a big part in shaping me into the person I am today. I also really enjoy the triathlon community so it makes it easy to want to contribute where I can. If you do get some video footage, feel free to send it my way if you want me to take a look at it.